I know, I know. I promised no more licensed characters, but I couldn't help myself. 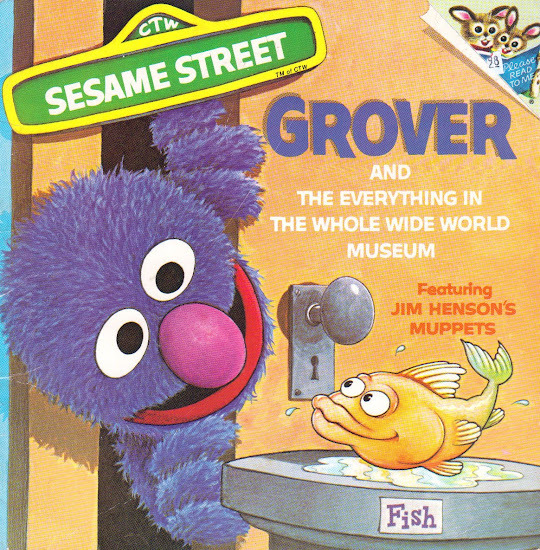 When I did that post the other day and was reminded of Grover and the Everything in the Whole Wide World Museum, I went searching all through the house and came up empty handed. Luckily, I stumbled across yet another copy last week at a book shop and fell in love again with what was most-definitely my favorite Sesame Street book from childhood. I'm sure my original copy is in like 80 million pieces somewhere at the bottom of a landfill because I loved it to death. Endless hours spent reading and looking and spotting things I'd missed before. So yea, Grover visits the EITWWWM and gets his mind blown by the zillions of wonderful things to see. Really, there are zillions of cool things to check out in this book as every page turn brings a world of wonder. 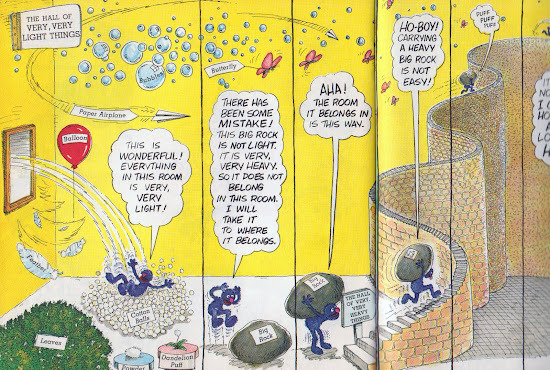 Plus you have lovable, furry, old Grover as your guide, and of course he makes everything slapstick and hysterical. You know, I have seen many things in this museum. But I have still not seen EVERYTHING IN THE WHOLE WIDE WORLD. Where did they put everything else? I'm afraid you'll have to read it yourself to find out. OH MY GOD. I am having such happy childhood flashbacks. I loved this book so much. What was it about this book that was so fascinating and also so cozy? It's not like I usually feel that way about made-from-TV books. This is the BEST BOOK in the Whole Wide World. Come back big rock! Love this! my youngest is totally into Elmo and I wish he could be more responsive to the rest of the Sesame Street characters! I'll keep my eye out for this! It is fun watching Sesame Street with him because some of the bits were from when we were young! How fun it is to share the same things! Thank you so much for posting this! I just got a copy also, and it brings back such wonderful memories! I loved grover, and also read my childhood copy of this and the Monster at the End of this Book probably to pieces! 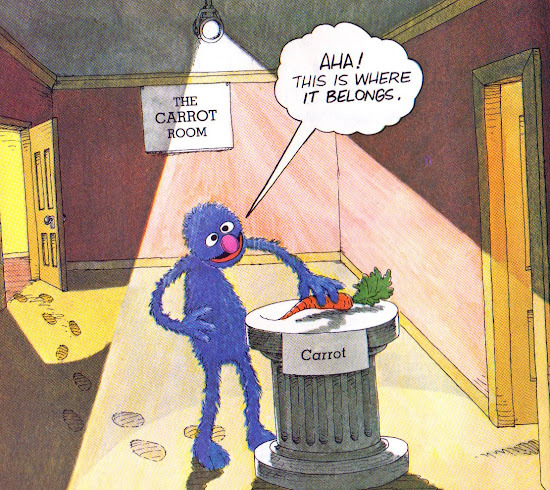 We should definately work on a Grover come back! Another book to look out for! I can't believe you reviewed this! It's my daughter's favorite book right now (thanks to my mom, who saved mine for me!) and we read it every day. It surprised me that she loves it so much, but we read it at least once a day. And it inspired a couple of my purchases from your Etsy shop, lol. I agree with Julie... it had a really cosy feeling and magical. That feeling really came from the page where he places the carrot in the carrot room. I'm going to look for the book in my parents' home after work. I feel like this book helped shape who I am today. It sparked a creative fire in me and got me looking at everyday life in a totally new way. Also related, I love museums now with outdoor scenes and objects inside--natural history museums with their dioramas of outdoor scenes. I get a cool feeling when I go to one and I have a feeling it's because it stimulates old, great memories of this book. OMG! I was looking everywhere for this book for my 2 year old - it was my absolute favorite book as a child of the 70's! 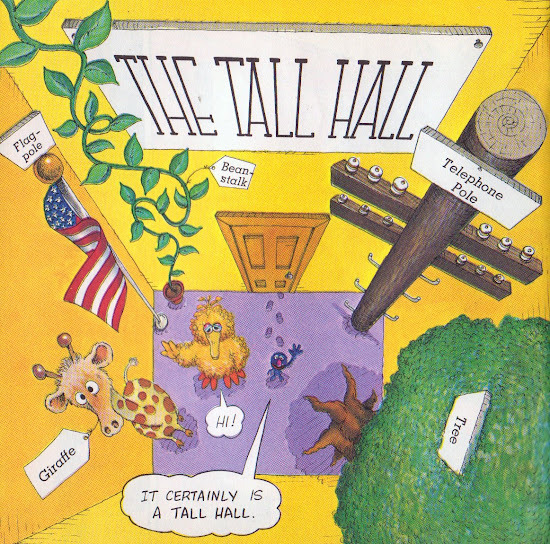 I didn't even remember the title or really what it was about other than how much I adored it, but my most vivid memory was of the 2 rooms with big and small things that Grover enters, exiting through the tiny door in the big room. There were so many details, I would spend forever absorbing every single image and detail on each page. I did a Google image search for "Grover big small", since those were the only pages I remembered and somehow the main picture of from your entry came up. I totally remembered the carrot room - yay, this was it!!! Just found & bought a hardback former library version on Ebay, I can't wait to read it to my kiddo! I also just recently found and bought an superb vintage Mickey Mouse hippity hop like I had as a kid (remember those? There was a Donald version as well) that I found on Etsy for a steal to give to my son for Christmas! This has been a great month for nostalgia and vintage finds. Thank you for featuring this book!